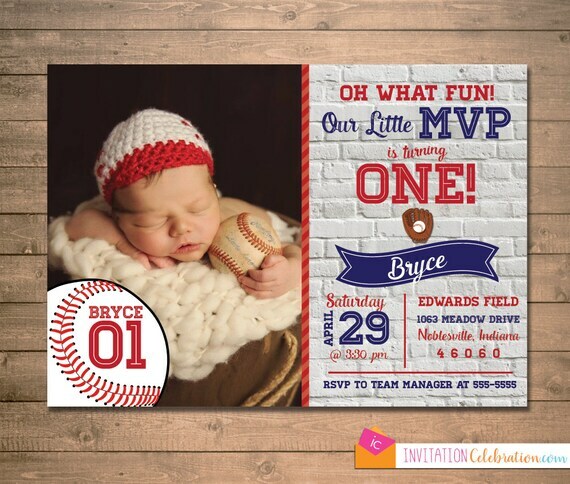 Celebrate your Little MVP's First Birthday with this vintage-modern Baseball Invitation. Navy blue and red atop a white brick background, your child's 1 year photo or newborn photo can be placed. Prefer no photo? Not a problem. Contact me for details. 6. Anything else you need included! Your digital proof will be sent to you via Etsy Messages within 1-2 days upon placing your order and providing all necessary event details, including an acceptable high-resolution photo. If you choose to have me print for you, upon your approval of proof, your order will be printed & ready to ship within 1-2 days. A proof & 2 revisions are included with all types of orders. Need any matching printable items? Favor Tags, Banners, Thank You Cards......Custom requests are always welcome if you need something you don't see in my shop!